Welcome to Maine snakes, where the slogan survival of the fittest aptly describes the state’s nine snake species, none of them venomous snakes. There used to be a Timber Rattlesnake population in the state that is now no longer there. Anyone familiar with the types of snakes that inhabit the eastern United State soon recognizes a core groups of snakes that appear in a variety of Midwest, Southeast and New England States. That core gets smaller and smaller in total number of species as the climate gets colder. Snakes survive and thrive in most areas because they have a sufficient time to bask in the sun and thereby regulate their otherwise coldblooded nature. The colder the state the less hospitable it is to coldblooded reptiles. 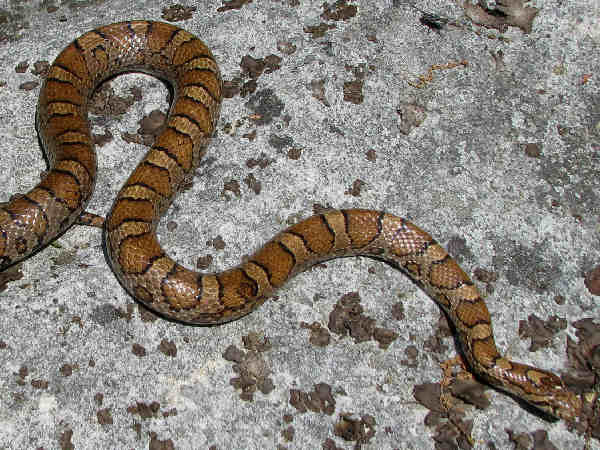 Maine’s core group of nine snakes share a few common characteristics. Most are small to medium sized snakes capable of burrowing underground and hibernating through the frozen winter months. 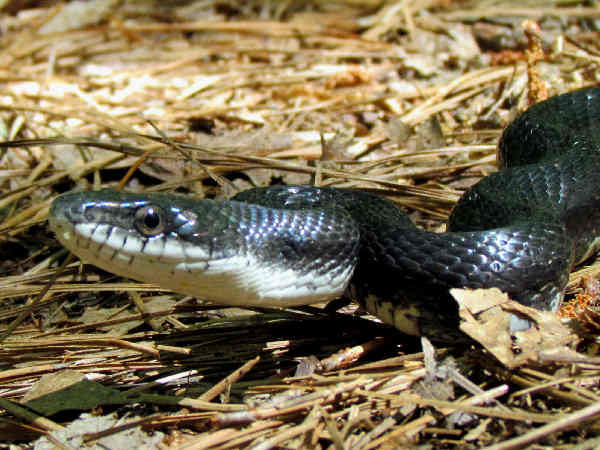 Black Racers (Coluber constrictor) can grow to about five feet in length, making them the Maine’s largest snake. They are also listed as endangered. Scientists have recently attached radio tracking devices to a small sample of snakes to better understand habits and thereby devise a policy to help with species survival. The top picture shows a black racer. Most if not all species tend to be comparatively thin and very fast movers. Garter snakes might be the second largest snakes in the state. They can grow up to four feet in length. Normally the typical garter snakes that residents see in their yards during the summer months do not grow that big. 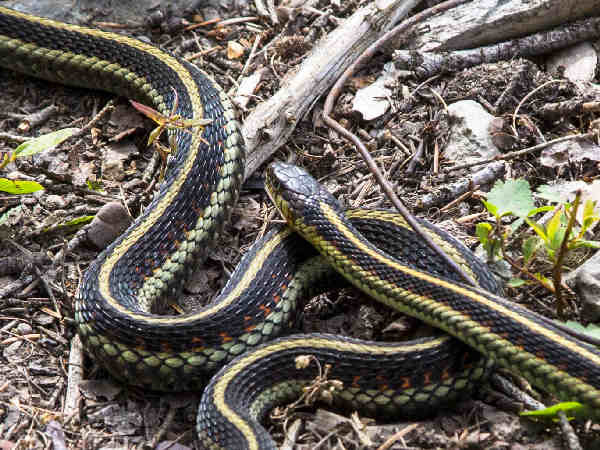 They belong to the genus Thamnophis, and two species live in Maine. 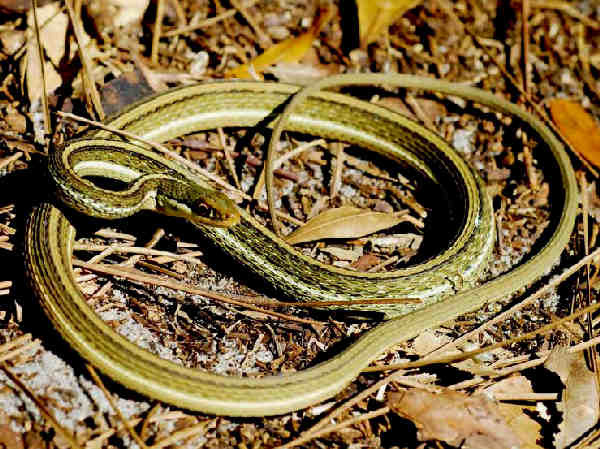 The first is the Eastern Ribbon Snake. (Thamnophis sauritus). They are called Ribbon Snakes because they are smaller and thinner than the other members of the genera. Additionally, Ribbon Snakes have a light color patch in front of the eye. The Common Garter Snakes (Thamnophis sirtalis) in the picture tend to blend into earth green and brown backgrounds. It’s called the Common Garter because multiple subspecies with multiple color patterns live in all of the lower 48 states. Eastern Milk Snakes (Lampropeltis triangulum) are very adaptable snakes, inhabiting multiples areas from fields to forests to farms. Finding Milk Snakes in the east can be as easy as taking a hike and flipping over a few big rocks or logs. The can grow up to on average about three feet in length and the red to orange to dull rust color of the bands makes them easy to spot. 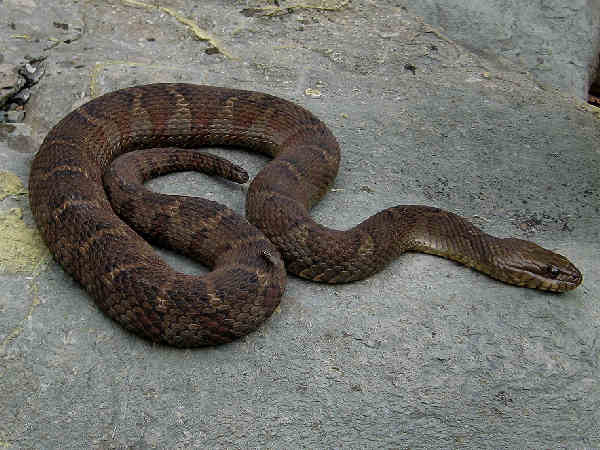 Nine watersnake species inhabit areas around the United States. They can grow to be large six or seven foot snakes. The Northern Watersnake (Nerodia sipedon) is probably the species with the widest range, including Maine. The body color changes depending on age and location. Most older states have very dark bodies without a visible pattern. Two of the three Storeria snakes also make their home in Maine, the DeKay’s Brownsnake and Red-belied snake. Both grow to about a foot in length. They are also very common throughout the entire East. 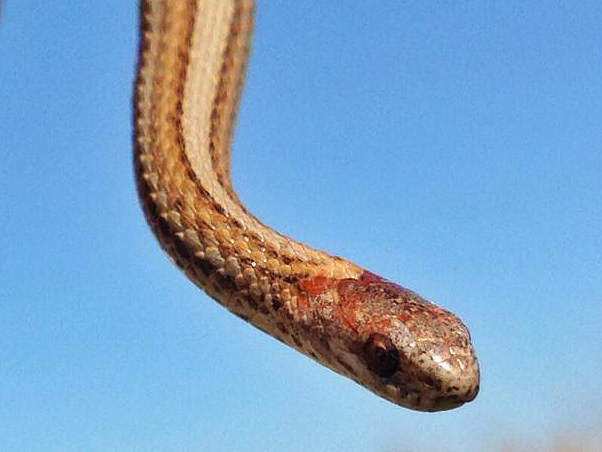 Brownsnakes look exactly like their name. They have brown bodies with a bit of darker patches on them. They are also habitat adaptable and can even survive in urban areas. 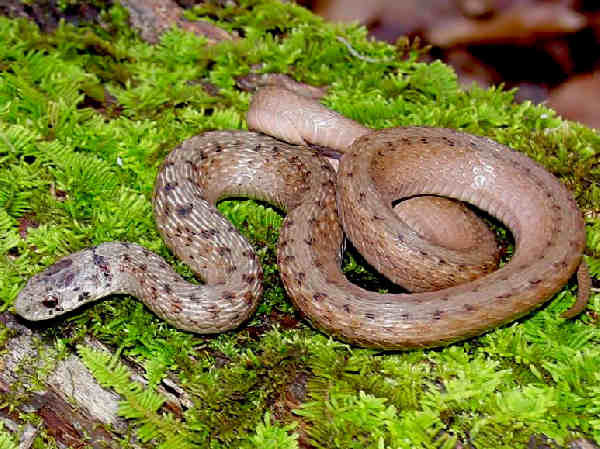 Red-bellied snakes prefer woodland habitats. Last, but not least are Maine’s Smooth Green Snakes (Opheodrys vernalis). They also are known as grass snakes. Following the pattern outlined, they are small, hardy snakes that can withstand Maine winters. Their range extends into Canada. 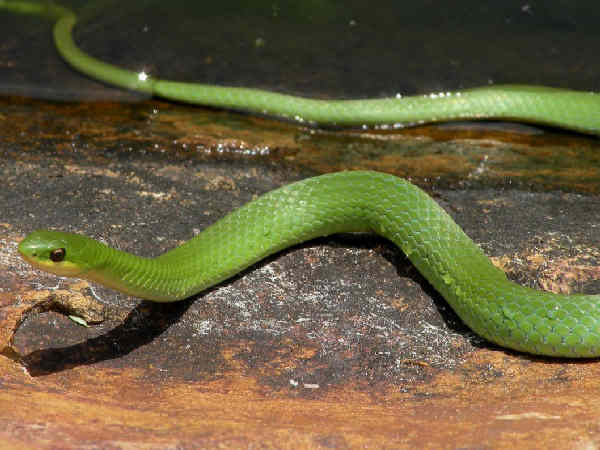 Smooth Green Snakes like the picture shows, have two toned bodied. A grass green skin is apparent on the top, providing them with camouflage in their native grasslands. The belly is a cream or pale color.